The other night, B and I were sitting around talking about how it’d be fun to play with a kiln and started wondering how much a small kiln would cost. 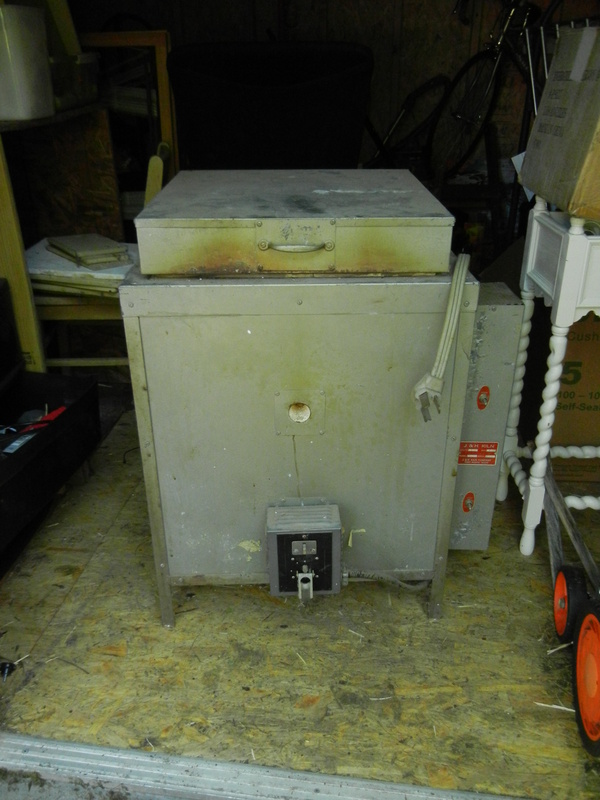 Looking at manufacturing websites made us believe we’d never have a kiln, but then we checked Craigslist. Boom! That night we drove out to Fort Worth and came home with a kiln. 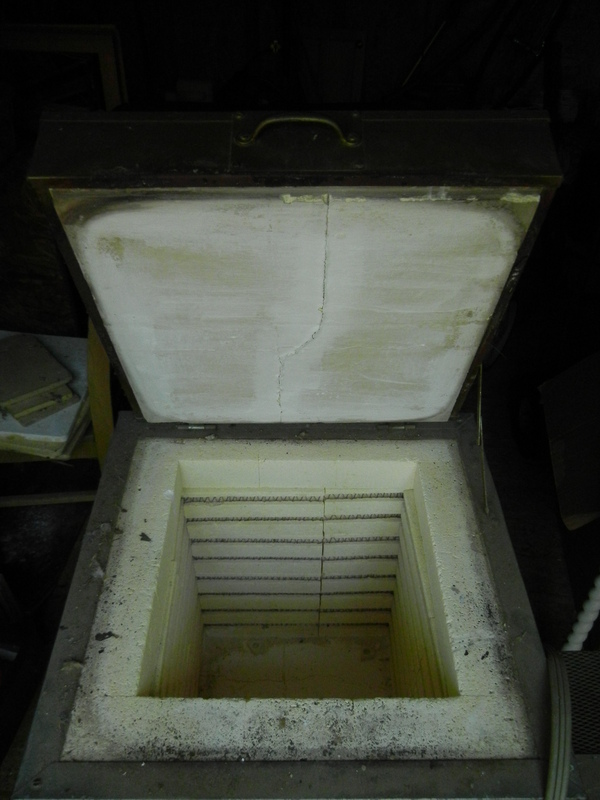 The man’s family was actually the original manufacturers of the kiln and included all of the original manuals and a bunch of extra cones and shelves. We haven’t fired it up yet because we don’t have a full load of pieces to fire but we were guaranteed a functioning machine and if there were any issues we were welcomed to call with questions. I love plants and I love collecting plants and I love looking at their delicate details. 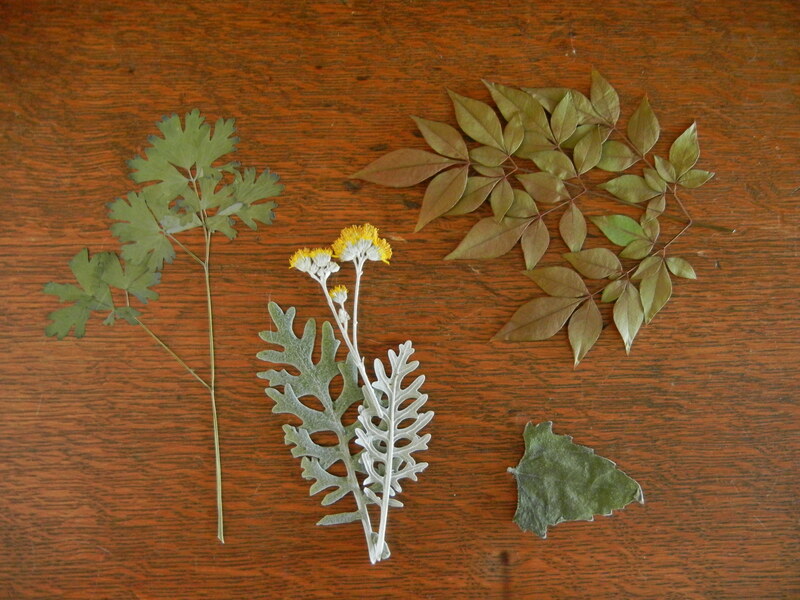 I’ve started collecting them to be pressed and preserved for my own herbology of plants in my yard and in my neighborhood. It is important to me to be able to recognize the plants around my home in order to learn what grows best in this area and to take note of when they thrive and bloom. Yesterday we scored an antique sears roebuck lathe for $5 at an estate sale down the street. They said it worked and we probably would have picked it up even if it didn’t – but guess what, it does. We purchased a link belt to replace the old belt and while we’re waiting for it to arrive in the mail we’ve been using it as a drawing machine. B has always wanted to create a drawing machine and having a motor that spins was the perfect opportunity! He taped a charcoal pencil to the motor and we fired it up. We were a little nervous about the pencil on the paper and how hard it would hit the paper but we were pretty easy with it. It took two people to operate the project – the motor vibrates so much that I had to hold it in place while B moved the notebook. Eventually it did break through the paper but it was exciting that it worked. There is a lot of room for experiment and it’s just like having a mechanical spyrograph.There are so many different drawing machines out there, hacked hexbugs, markers tied to tree branches, you name it. As I’ve mentioned before, I’m working on saving seeds from this year’s garden for the following seasons. 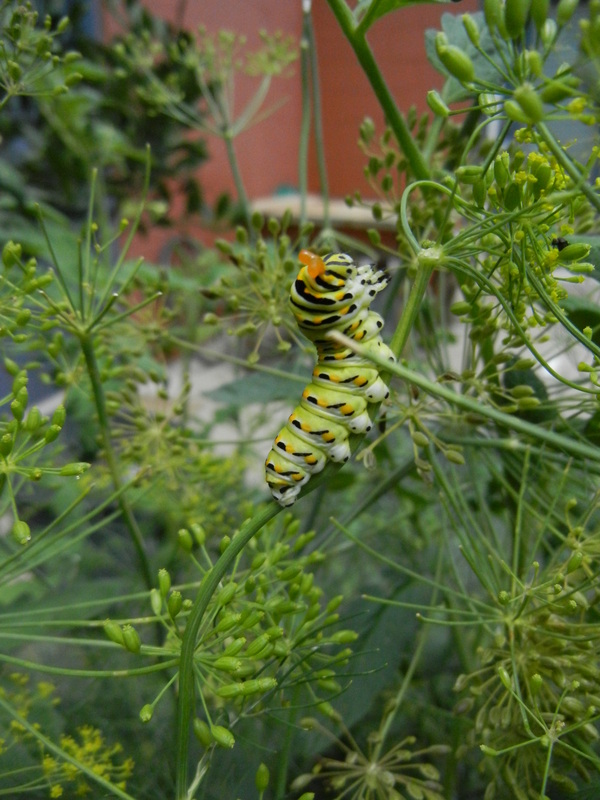 Right now the race is on to collect dill seeds before the swallowtail caterpillars get them all. 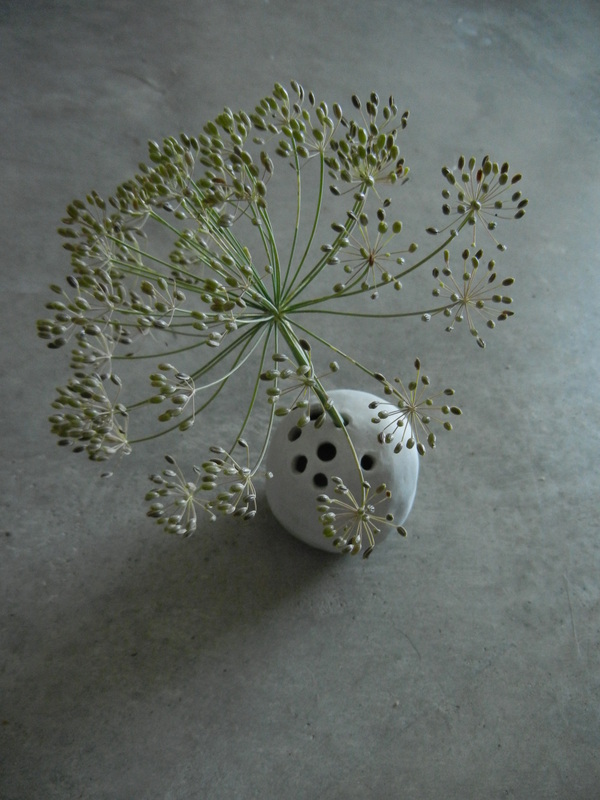 The vase is a small ceramic piece that I haven’t fired yet but I really like and will probably produce more of. 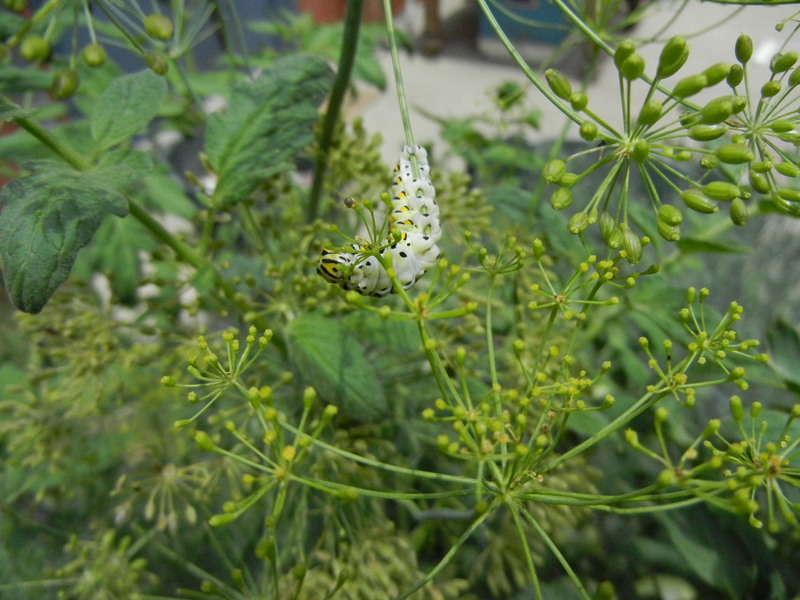 I do love swallowtails and usually do plant extra dill to make sure I have a good population, but I’ve never worked on saving seeds before and am realizing that the caterpillars may eat them all before I have a chance to save some. The caterpillars are more than ready to show their ire at me taking their food. As a kid I always got a big kick out of watching them show their horns whenever we poked them. I now know they are called scent horns or osmeterium and will release a weird citrus scented pheremone into the air to ward off predators. 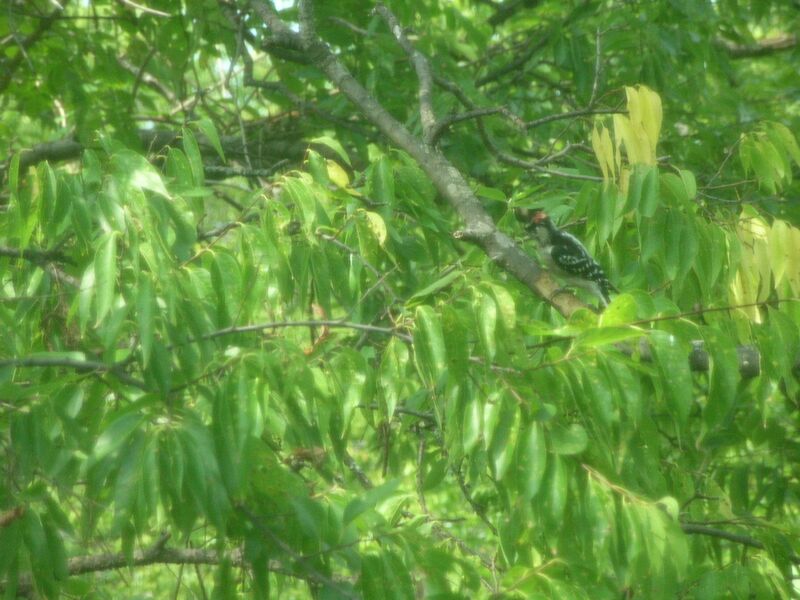 I love the wildlife that is in my garden and will never cease to be amazed by it. The little kid in me that loved to poke the caterpillars to see their horns has been replaced by an adult that loves to poke the caterpillars to see their horns and then do research about and learn their scientific name. 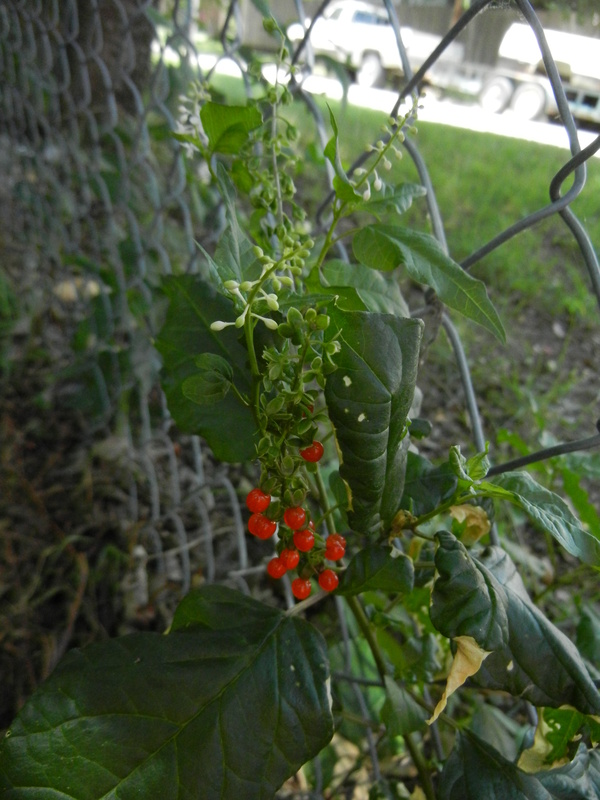 Meet Pidgeon berry, rouge plant, or Rivina humilis L.
This small deciduous perennial has been popping up everywhere in our yard (along with a lot of imitation ragweed) and until today I had only wild guesses as to what it was. 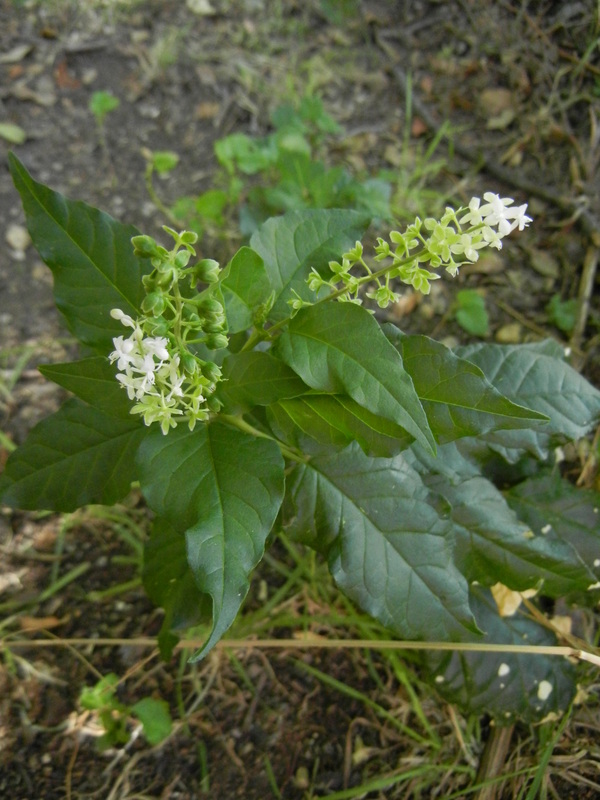 With help from Wildflowers of Texas by Geyata Ajilvsgi and a little online research, I now know what it is. As a gardener I appreciate a shade loving perennial that can produce flowers and such bright berries. (The wrinkly burnt edges of the leaves are the result of one of our dogs repeatedly marking the same spot along the fence. It’s pretty impressive that it has survived at all, normally Jake’s pee just kills the plant.) When the soil is kept moist the plant will bloom until October, during drought the plant will go dormant and then shoot up after a good rainfall. Growing up in TX where rain during the summer is already rare and magical enough, having plants that break out of dormancy with rain has always made a good thunderstorm even more exciting. Every part of the plant is toxic so it doesn’t really have a place in the vegetable garden or around the chickens. As an artist, this plant definitely has a place in my ornamental/dye garden though. The red berries have traditionally been used as a source of red dye, hence the name ‘rouge plant’. 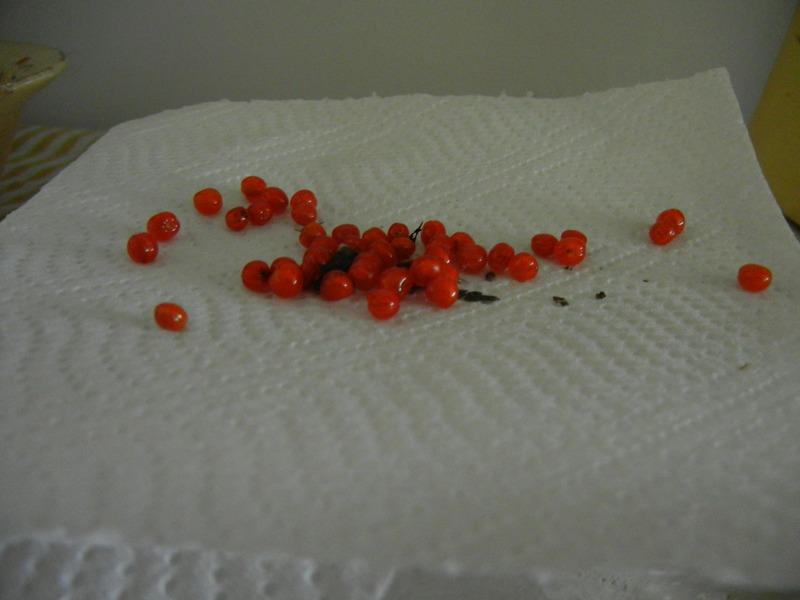 I’m drying these berries to save seeds from and propagate a good amount of plants. The dye can be obtained the way you would collect dye from other berries – mashing the fruit, soaking, straining, and treating the fabric. I haven’t been able to find an example of the color produced but plan on experimenting and will be sure to post what I find. 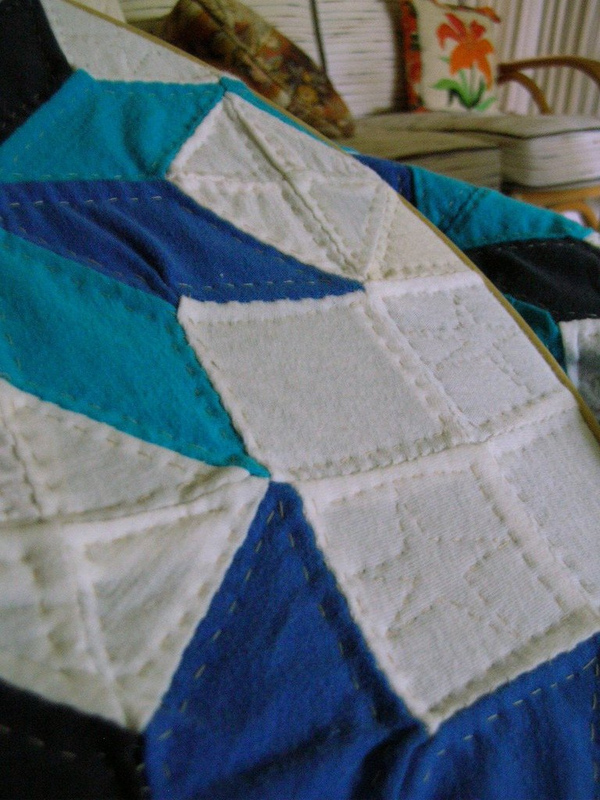 A great source of natural dye plants is at Pioneer Thinking; it can be fun to see what you have in your garden already that can be used for dye and even more fun to plan a garden for the purpose of dye production. Pruning the eucalyptus tree is never a hardship – the house smells great and the tree looks shapely. 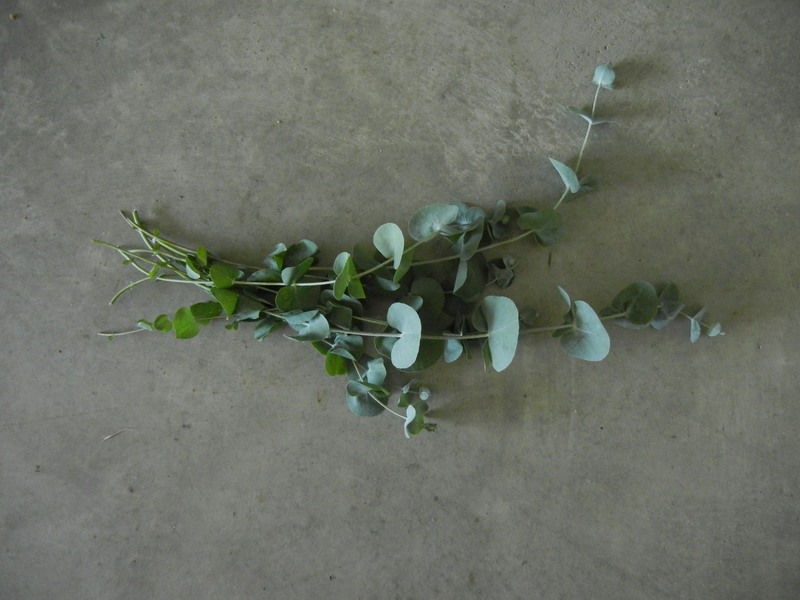 The simple shapes of the leaves and their silvery green color is such a beautiful contrast to the concrete floor.